Miranda Clark Kansas Sprinter Runner, Teen runner disqualified for using tape, Kansas teen DQ’ed for running with tape over earrings; if uncovered would have been warned, Sprinter Miranda Clark actually increased her penalty by trying to do the right thing. 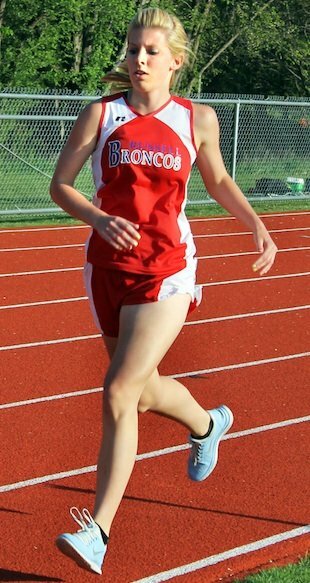 On April 10, Miranda Clark was getting ready to line up for the start of the 1,600 meter race at the Ellsworth Invitational. The Russell (Kansas) High student was ready to roll when she noticed that she had in earrings, a result of a recent ear piercing. Knowing that wearing jewelry in a race is forbidden in sporting events by the Kansas High School Activities Association, Clark knew she couldn't run with her earrings showing, so she did what most athletes do to make jewelry less conspicuous: She covered them up with tape.